Salaries and pensions/government transfers are by far the most important sources of income, mentioned by around 50% of people in all three countries. 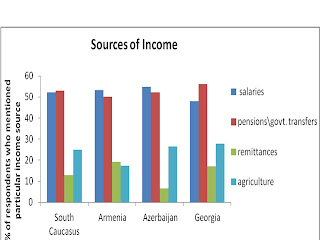 Agriculture is mentioned as an income source by over 25% of respondents in Azerbaijan and Georgia, but is reported by only 17% of Armenians, where remittances are the third most common source of income. Twenty percent of Armenians and 17% of Georgians report income from remittances, but family transfers are relatively rare in Azerbaijan, with fewer than 7% reporting receiving remittances. In the South Caucasus as a whole, people who list salaries as their household’s primary source of income have half the average material deprivation rate of 32%. By taking the ratio of the average rate of material deprivation (blue bar) and the material deprivation rate for salaries as the primary source of income (red bar), Chart 2 shows that households primarily relying on salaries for income have less than half (44%) the average material deprivation rate in Armenia. This figure is 52% of the average material deprivation rate in Georgia, and 63% of the average material deprivation rate in Azerbaijan. Furthermore, households in the South Caucasus that did not report salaries as an income source are 1.4 times as likely to be materially deprived. Pensions and government transfers are the second most important source of income in the South Caucasus. Chart 3 shows that households where government transfers are the primary source of income have more than 1.5 times the average rate of material deprivation, while those where pensions and government transfers are the second source of income have three-fourths the average rate of material deprivation. This suggests that government transfers throughout the South Caucasus are not large enough to live without poverty, but can effectively supplement a main income. The trend is most extreme in Armenia where households relying on the government for their primary source of income are over two times as likely to be materially deprived, while households where government funds are a secondary source of income have three-fifths the average rate of material deprivation. 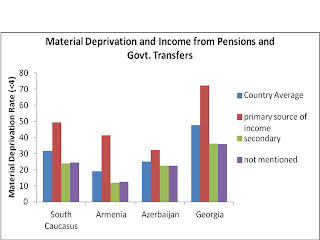 In Azerbaijan, government transfers have a much weaker correlation with material deprivation. In fact, data from graphs 2 and 3 shows that households receiving government transfers as their primary source of income are twice as likely to be materially deprived as households dependent on salaries in Azerbaijan, three times as likely in Georgia, and five times as likely in Armenia. 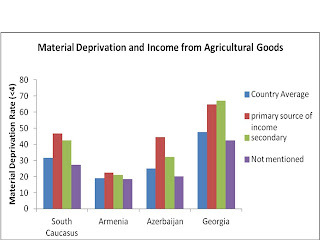 As chart 4 shows, income from sales of agricultural products is correlated with higher material deprivation rates across the South Caucasus, supporting previous findings showing that material deprivation is concentrated in rural areas. Armenia has the lowest percentage of households reporting income from the sale of agricultural goods, and also the smallest changes in material deprivation based on income from agriculture. Georgian households dependent on agriculture for either their primary or secondary source of funding are around 1.4 times more likely to be materially deprived than the country average, while Azerbaijani households are almost 1.8 times as likely. In Armenia and Georgia, relying on pensions and government transfers is the strongest indicator of material deprivation, while in Azerbaijan it is dependence on sales from agricultural products. 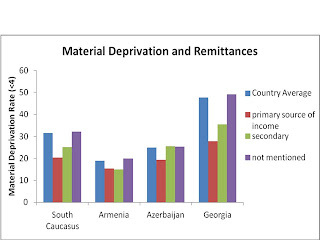 Only 13% of respondents in the South Caucasus report receiving money from remittances, but chart 5 shows that households most reliant on remittances are less likely to be materially deprived. The trend is especially strong in Georgia, where households dependent on remittances as the primary source of income have 58% of the country’s average material deprivation rate. Although overall trends are consistent across all three South Caucasus countries, the importance of each income source on standard of living varies rather widely. 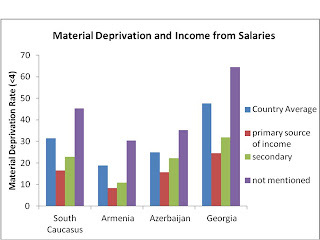 Material deprivation in Azerbaijan seems to reflect a large divide between urban and rural areas, with family transfers, salaries, and government transfers much less strongly correlated to changes in material deprivation than in Georgia or Armenia. In Georgia more people mention government transfers than salaries as an income source, and for those reliant on state transfers, the material deprivation rate is over 70%. Although Armenia has by far the lowest material deprivation rate, at under 19%, it has a huge disparity between households with salaries as their primary source of income and households dependent on government transfers.